James and I moved into a lovely place, which has a back deck that gets a surprising amount of sunshine for a space between buildings. In San Francisco, things run a little chilly, but for the plants that like that sort of thing there is a sort of eternal springtime. James described San Francisco's weather as a British summer every day, and I think that's pretty apt; at 4pm on the nose, things usually start to noticeably chill as the wind comes in off of the Pacific Ocean, blowing from west to east as the sun begins to dip. Tourists in shorts begin to ask about "I <3 SF" sweatshirts and Irish coffees, and locals pull cardigans out of messenger bags as if choreographed. Consequently, it is not necessarily easy to grow a garden on my deck. While I have a tendency to plant tenacious vines that can climb little bamboo trellises from any windowsill, my little seedings had a rough time through this summer. Happily, three little morning glory plants managed to make it, even after a perilous run-in with some mold after their seed packet got damp. Two of them, despite feeble growth, even flowered. Such is the tenacity of the morning glory. It turns out, these pale blossoms caught the eye of a young hummingbird. To be honest, I think that more than one came by, as they are constantly surfing for new terrain with nectar-bearing flowers in bloom. At the time, though, these few flowers were only enough to attract some curiosity. One bird kept coming by. Like clockwork. I would be sitting, writing, and a quick little figure would zip up and peek into the lattice work around the deck. It was like magic. My little visitor would sometimes fly in, see if anything was going on, and occasionally look through the window to see what I was up to. So, basically, I bought this little imp a candy machine. I decided the hummingbirds were trying to make friends, and that the moment might pass. I found a beautiful little glass ornament--which could almost be nestled into a Christmas tree and not look wrong--and hung it up on the lattice. I was worried it was too hidden, that they wouldn't want to come into a semi-enclosed area to drink, but James suggested I just put it out there and see what happened. Thus, I got to know Vic. I think Vic kind of got stuck with the deck as his territory because he was a young male, and the deck is pretty crap territory for an older bird with some authority. It took me a while to figure out that he was, in fact, male, since the young Anna's hummingbirds all sort of look like their moms. When grown, the males have these incredible iridescent feathers that radiate out from their beaks to their foreheads and throats. The feathers are actually covered in little cells that reflect light only from certain angles, so their color flashes out of nowhere when they change the angle of their heads. When these feathers are grown in, they look awesome. One of the fascinating things about Anna's hummingbird is that they have a song, and they can play it with their voices and tails. Their little throats are not big enough to make a very loud call, so they can also use their tail feathers to emit a noise in the same tone. They do this when they perform these incredible daredevil dives to tell others to piss off. Hummingbirds, it turns out, are like super-caffeinated fighter pilots. They are very territorial (even the males toward females, and vice versa) and spend a lot of their day launching themselves at high speed toward intruders. Even potential mates get treated to a version of this; it seems that the males eventually shift their aggressive ousters into a courtship dance, and romance ensues. So, day by day, I get treated to all of these little dramas. Vic sits and sings, and occasionally his girlfriend sneaks in, steals his sugar-water, and they perform some complex aerial maneuvers. I see them do all kinds of interesting things, too. Like, they check out my seedlings in the pots on the railing. I replanted my garden, in the odd autumnal warmth that is peculiar to San Francisco, and anytime I change anything--or meddle, more likely--my efforts are examined by my little green bird friends. They've found a break in the lattice big enough to use as a doorway or perch, from which they can ambush one another. Just this morning, Vic's girlfriend was brave enough to go inside the narrow space between the sheets of lattice above the deck rail, where she snuck a drink from the hidden space at the back of the feeder. It is kind of a big responsibility to feed little birds, especially in the cold. Anna's hummingbirds live in cloud forests, which sounds so dreamy; they are adapted to the cooler climes, and eat bugs and tree sap to keep their fast metabolisms going in low temperatures. Costa Rica is the hummingbird epicenter, it seems, and we are far from that tropical climate here. 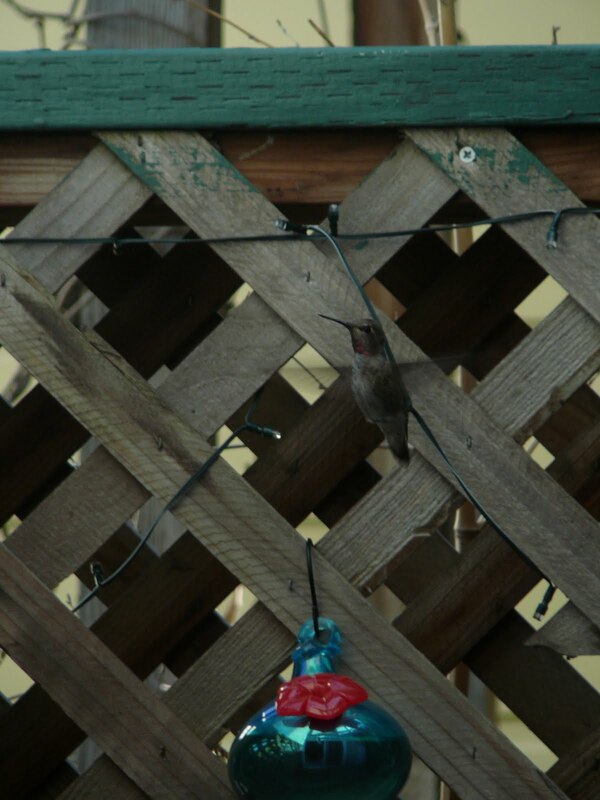 Anna's hummingbird stays around here year round, and they start nesting late in the year. So, my little feeder gets cleaned thoroughly, refilled and immediately replaced every few days. When one of them dropped a feather for me, the tip was a silky iridescent green and the base was fluffy down; a furry undercoat is essential when you're three inches long and living out in the rain. Right now, Vic's little territorial games are a little more loaded, since my little fairy garden seems to be rapidly transforming into a love-nest. I have to be considerate and disrupt that as little as possible, and so I remain consistent, tending the garden and being around just enough that the sugar always flows and the flowers grow happily. There are no cats to haunt my deck, the wind is not so brisk, and so I feel glad to have taken a little patch of barren built-up space and rendered it part of an ecosystem once more. These sassy, magical little birds, who are just as curious about me and remarkably unafraid of my relatively lumbering pace, have inspired me to build a sanctuary that we share, and it's pretty special.